The rustle and click of bamboo forests welcomes you into the fold of an Indonesian village. The rhythmic ringing of bells calls you into the homes of Banjar and Kebyar. Inside the heavy timber, cedar post and beam construction are suggestive of the traditional framing techniques in Indonesia which incorporate rough-hewn logs gathered from the forest. You spot the elusive Sumatran tiger crouched outside the window among the vegetation. Nearby, orangutans swing freely in the trees and observe their guests with curious eyes. Later on, you come back to a different view: a singing, hooting chorus of lesser apes, the siamangs, romping Malayan tapirs, and babirusas — wild pigs with remarkable tusks. In the Islands area, you never know which animal you may meet and where! In each outdoor habitat, hot rocks are strategically placed to provide desirable lounging spots for the animals — this gives guests an upclose view into the daily activities of these spectacular creatures while providing a warm, cozy spot for the animals to enjoy during cooler temperatures. A stream, the life force of the monsoon forest, runs along the perimeter of these viewing buildings and through the tortoise yard where you see aldabra tortoises roaming, munching on a leafy meal and even enjoying a swim. The call of sea-birds and crashing waves draw you into the Islands Pavilion. Survival Stations featuring rare species of birds like the Victoria crowned pigeon provide insight on how the Louisville Zoo keeps these special birds from joining the thousands of species that have become extinct. Just beyond, you are enveloped into the mists of the tropical forest and the lush botanicals of the bird trail. In this free-flight aviary home to birds from tropical islands around the globe, brightly-colored jambu and wampoo fruit doves roam and fly freely, landing on branches only inches above your head. After experiencing the warm tropical air of the bird trail, you exit only to encounter the brisk chill of the peri-antartic and sub-antartic sea cliffs. You are pulled into the rocky coastal habitat of the rockhopper penguins as they dive and swim in the cool water while Inca terns fly overhead onto surrounding rock formations. Journey back to the days of the dinosaurs is only a few steps away where you come nose-to-nose with Cuban crocodiles, a reptile species that has been around for millions of years. After exploring the Islands, take a few peaceful moments to rest and refresh! The serenity and shade of the Village Commons provides a calming spot to sit, enjoy the breeze, recharge and take pictures to remember your journey together. You’ve now had an ideal tour through the Islands. These sights change daily. 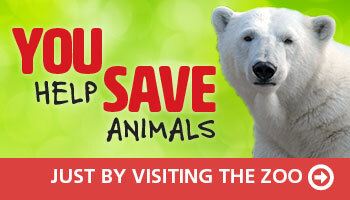 Learn why an exhibit that uses a rotational habitat strategy is good for the animals and us! The best way to experience all of the adventures is with a Zoo membership — your Frequent Fun Pass!